Part II: "Who is the Anti-Christ?" It has been irrefutably demonstrated in Part I (by the enemies own words) that the idea, so common today, that everyone is basically good, and means well, is simply another one of the great deceptions of the 'father of lies' who "seduceth the whole world"(Apoc.12:9), and that many, in fact millions, incredibly, have actually chosen that hideous dragon as their 'king' ! Having spread like the "foul plague" that they are, (as described by Leo XIII), these disciples of Lucifer, through infiltration and takeover of nearly every government and education system, the mass media, and the modern Catholic Church, have attained virtual global control! "He'll be a world dictator"
Evidently, this widespread delusion has been part of that "operation of error" God allows to befall a stiff-necked people who, as in Noah's day, "Receive not the love of the truth that they might be saved." 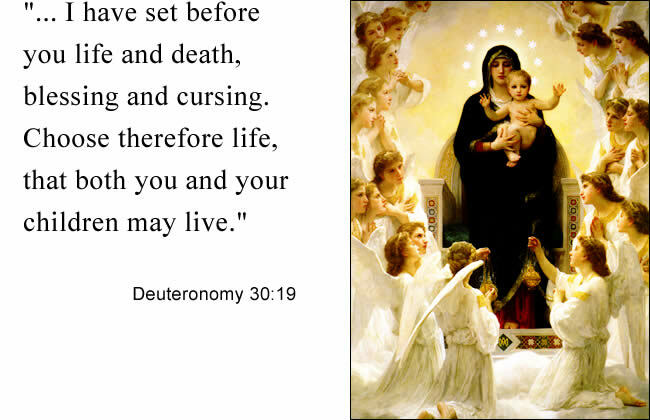 (the "truth", is the unchanging, Divinely Revealed, Traditional Catholic Faith). Through the employment of some good old common sense and logic, we can come to see that perhaps this prideful, masonic 'spirit of the age' has robbed us of our spiritual sense...if the anti-Christ is fully possessed by the devil (and he is), then he's not out to destroy multitudes of bodies, he's out to damn multitudes of souls! And he does that by attacking the one soul-saving Faith. It is of crucial importance to note that the TRADITIONAL Catholic Faith, is the ONLY Religion not tolerated by the Masons and their father the devil! 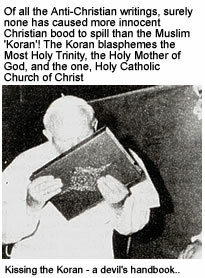 Consider that his very title 'Anti-Christ', denotes his diabolical efforts and scheme to supplant and replace Christ and His True Catholic Religion, the road to heaven - with a lie, a false catholic religion (of Ecumenism), another road to Hell! This is exactly what he has done! * St. Hilary says that since the title "son of perdition" used by St. Paul in reference to the anti-Christ (2 Thes.2:3), was used by Jesus in reference to Judas (John 17:12), we can know that the anti-Christ will be, like Judas, an apostate bishop. * On Sept. 19, 1846, our Lady foretold at LaSalette that: "ROME WILL LOSE THE FAITH AND BECOME THE SEAT OF THE ANTI-CHRIST." * St. Alphonsus taught that 666 - the number of the beast (Apoc.13:18) represented that the Anti-Christ will be distinguished by the doctrine that man is God - the number 6 being considered to be man's number, since man was created on the 6th day, and God's number being 3. So the belief that man is God is represented by 6 three times (666). Paul VI says in 'Documentation Catholique'(no.1580): "All honour to Man, king of the earth and now prince of the heavens!" 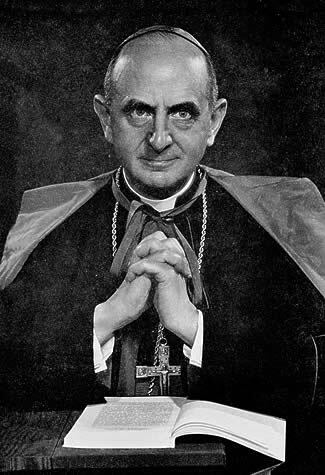 * In his book "Windswept House", Malachi Martin (formerly an exorcist) reports that on June 29, '63, the night before Paul VI's coronation, a black mass was celebrated and satan was enthroned in the Vatican! Not all the devil's 'offspring' show their true colors. Pictured below are two who do. The Devil's One-World-Religion in the making. "They presuppose the erroneous view that all religions are more or less good and praiseworthy, inasmuch as all give expression, under various forms, to that innate sense which leads men to God and to the obedient acknowledgement of His rule. Those who hold such a view are not only in error; they distort the true idea of religion, and thus reject it, falling gradually into naturalism and atheism. To favor this opinion, therefore, and to encourage such undertakings is tantamount to abandoning the religion revealed by God." 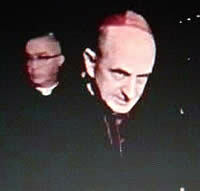 * "HE (the anti-Christ) WILL SIT IN THE TEMPLE OF GOD" (2 Thes.2:4) The Catholic Church is the ONLY Temple of God. James 4:4 : "Whosoever will be a friend of this world, becometh an enemy of God." * Paul VI appointed the MASON 'father' Annibali Bugnini to head a committee - which included six protestants - to concoct the 'novus ordo missae' (the new mass), a phony, unlawful, protestant, sacrilegious, and invalid substitute for the True Mass. Daniel 8:12 : "And strength was given him against the continual Sacrifice, because of sin: and truth shall be cast down on the ground and he shall do and shall prosper." 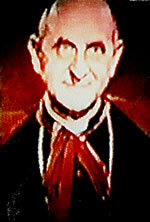 * In 1966 Paul VI abolished the ban on forbidden books. He also removed the ban on all un-approved apparitions. 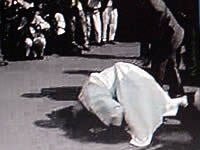 (Sister Lucy of Fatima, however, remained under a 'gag order' ever since!) 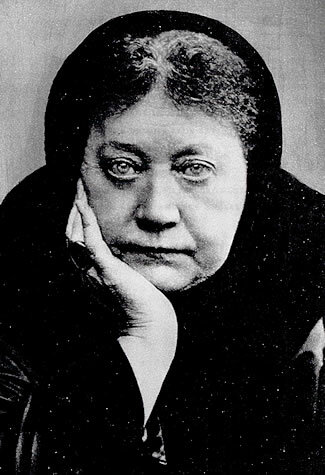 Prophecy of Marie Julie Jahenny, Briton Stigmatist (1891): "During the time of the approach of the punishments announced at La Salette, an unlimited amount of false revelations will arise from Hell like a swarm of flies; a last attempt of Satan to choke and destroy the belief in the true revelations by false ones." It is crucial to understand that the devil doesn't mind revealing a lot of truth so long as he can keep modern Catholics following and supporting his post-vatican II anti-Church and anti-Pope. * Former exorcist 'Malachi Martin' informs that the Satanist 'black mass' , is the Traditional Roman Mass said backwards - (with an upside down crucifix on the 'altar' ). He says they don't bother with the 'new' mass, because they KNOW IT'S NOT A REAL MASS. (from audio tape "The Kingdom of Darkness") . * He issued the evil document 'Humanae Vitae' which taught for the first time in the history of God's Church (old testament or new) that married couples could regulate the number of their children. In Sacred Scripture we read (Tobias chap.6) that even such an attitude in marriage, is so extremely hateful to God, as to allow the devil to prevail! With the serpent's cunning, Humanae Vitae served simultaneously to cause most Catholics, with their faith already 'masonically mutilated', to imagine he was a faithful Pope. * John Paul II has called Paul VI his "father" and "mentor"
* He takes his name from John XXIII and Paul VI, and never refers to the Name or teaching of any Pope prior to the Apostate Vatican II council. * During one of his speeches at the U.N. in Oct. of '79, J.P.II said: "In reality, what justifies the existence of any political activity is service to man. In the final analysis this activity comes from man, is exercised by man, and is for man. * In December of 1996, the Grand Orient Lodge of Italian Freemasonry offered John Paul II their greatest honor, the Order of Galilee, as an expression of thanks for the efforts the Antipope has made in support of Freemasonic ideals. The representative of Italian Freemasonry noted that J.P.II merited the 'honor' because he had promoted "the values of universal Freemasonry: fraternity, respect for the dignity of man, and the spirit of tolerance, central points of the life of true masons." An honest evaluation of the (ever increasing) incriminating facts against J.P.II, in light of the Scriptures regarding anti-Christ, makes credible the conclusion that the anti-Christ is one animating Spirit actually occupying two persons: Paul VI and John Paul II. (Objection) Why, then, does John Paul II hand out Rosaries? (Answer) Why do child molesters hand out candy? The most dangerous wolf in sheep's clothing, is the one that looks most like a sheep. He has something to please everybody but God. That's why he's the most loved man in this wicked world! But Isn't he to reign only 3 1/2 years? Virtually all Scripture scholars have concluded that this period is used symbolically. For example, the Jerusalem Bible footnote on 'Revelation 11:3' reads: "This period (three-and-a-half years) taken from Daniel, had become the symbol for any persecution, cf. Lk 4:25; Jm 5:17. *The picture at right is taken from the cover of Issue 5 of 'A Voice Crying In the Wilderness', a magazine containing 58 pages virtually full of quotations of John Paul II saying, subtly or openly , that 'man is Christ' - 'man is God'! * Pope Saint Pius X 'E Supremi Apostalatus', Oct.4,1903: "The distinguishing mark of Anti-Christ: MAN HAS WITH INFINITE TEMERITY PUT HIMSELF IN THE PLACE OF GOD. *Antipope John Paul II, 'Redemptor Hominis' (#10) states: "In reality, the name for that deep amazement at man's worth and dignity is the GOSPEL, that is to say: the good news." *John Paul II, General Audience, Feb. 22, 1984: “…so that consciences can be freed in the full truth of man, who is Christ." * J.P.II, 'Fides et Ratio' (#107): "Only in this horizon of truth will people understand their freedom in its fullness and their call to know and love God as the supreme realization of their TRUE SELF." 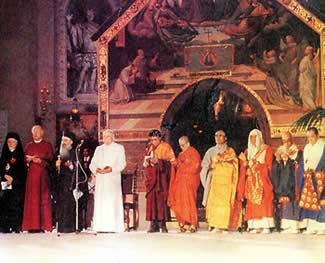 By preaching that man is God - that every man is Christ, John Paul II is dispersing, or "dissolving" Christ. (1 John 4:3): "EVERY SPIRIT THAT DISSOLVETH CHRIST IS NOT OF GOD: AND THIS IS ANTI-CHRIST, OF WHOM YOU HAVE HEARD THAT HE COMETH." * As Catholics venerate Sacred Scripture, the Crucifix, sacramentals, etc., the devil's 'offspring' venerate the blasphemous books of infidels, and - the earth - the habitation of man, and the domain of Satan! At our Lord's temptation in the desert, satan said: "All these (kingdoms) will I give Thee, if falling down thou will adore me." 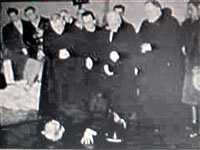 Paul VI and John Paul II do fall down and adore, while venerating the place from whence they came! Our Lady said at LaSalette "The Church will be in eclipse." The True Faith, the True Gospel, which can never be destroyed, is being 'eclipsed' - hidden, by the anti-Christ's post-vatican II anti-Church and anti-Popes. "And if our gospel be also hid, it is hid to them that are lost, in whom the god of this world hath blinded the minds of unbelievers." (2 Cor.4:3,4). St. Athanasius said: "Even if the true Church of Christ were reduced to a handful of true believers and one true priest, they would remain the true Church of Christ on earth." 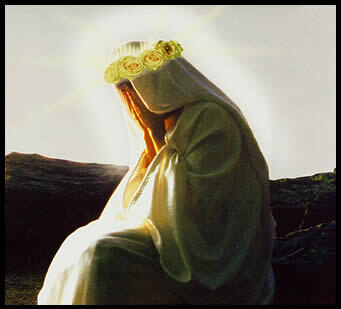 Sister Lucy of Fatima said in an interview with Father Fuentes in 1957, (just before John XXIII’s election: "The devil is about to wage a decisive war with the Virgin(Mary); we either belong to God, or we belong to the devil, there is no middle term." Without a doubt, anyone who wishes to be among the saved, must immediately and totally anathematize the counterfeit popes and religion, and with the Daily Rosary and a True devotion to Mary, embrace the eternally True Faith. She will never fail to guide those who ask, if they "receive love of the truth." On the other hand, those knowing the facts revealed in this presentation, who continue to follow John Paul II and Paul VI's vatican II ecumenical religion, and to attend or support the new mass, are following the ANTI-CHRIST. Can anyone walk the road to hell and end up in heaven? Friend in any of those times you've given thought to the coming of the anti-Christ, did you ever once think that those who followed him would be saved?